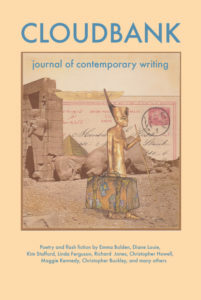 Cloudbank 10 includes poetry and flash fiction by Emma Bolden, Diane Louie, Kim Stafford, Linda Ferguson, Richard Jones, Christopher Howell, Maggie Kennedy, Christopher Buckley, and others. Bunch of Animals by Henry Hughes and Dark Energy by Robert Morgan are reviewed. Poets think in images. When we read, lines of verse blossom into mental pictures. Meaning, content, and personal experience can take a back seat to visionary expressions. Stories are told in filmic sequences rather than verbal narratives. It’s as though the brilliant night sky were reflected on the earth or the earth and sky have become one cosmic light show. This is an image you can carry with you on your next late-night journey. race over the ground below. Run-on sentences work well for cramming several images into a few lines. In Carson’s poem, the soup course and entrée are stirred (not shaken) with a hot-air-balloon adventure and an imagistic commentary on dictionaries and how they infuse the airborne (and everyone else) with the light of knowledge. Journeys of memory are potent opportunities for personal growth and discovering—or rediscovering—the poetic voice within. Fanny Howe’s latest book is Second Childhood. For many poets, reading this book will involve a rebirth of sorts. The stories we tell about early childhood experiences can be transformed into magical events. her crèche smudging out the color in her cheeks. with a house under it. For those who haven’t yet experienced a second childhood, these lines could be a wake up call. The heaviest stones felt best to Agatha, felt most flat and balanced in her palm. Flat and balanced, she thought to herself, flat and balanced, with every unsteady step she took away from the party. It was the party that had unsteadied her. It was, like most things in past tense, at first beautiful, at first all gin and juniper, all conversations chorused into rhythm with each other. She was wearing her June freckles and her August hat and even the orchids made her sweat. All night the lights seemed intent on sparkling. Eventually it became ruthless, that garden and all of its glitter and laughter, and the guests took on the sadnesses all guests take on as they approach the axis of goodbye. It started with the sky, with the inked corners of color soaking up from the horizon. She had so little time. All night, she had been gathering them, the heavy stones, the steadying stones. She couldn’t help it, couldn’t help her hands or her pockets. Someone in the corner had been singing with the roses, just before she left, and the scent of the tune followed her. She knew it came with a full set of notes, a full set of lyrics. It was at once imperative and impossible for her to remember. She’d felt like this for six months, felt like the trailing vapor of a song, with and without a full set of notes and lyrics. Neither mattered now, she told herself. Inside of her body inked the illness, soaking upward from the place where she never made or carried a child. It was getting too close to September. She was getting close to the river. She could smell it, even if she couldn’t see it. In her pockets, the stones sang their notes to each other, and there was a sweetness to their crashing, as if all at once every fragment of the world at least gave an effort. The song in the party’s corner had been a hymn, perhaps, about grace or salvation or a life heavied and steadied by its own hands. She took off her shoes so that she could feel the grass become bank and then shore. She wanted to feel it, all of everything and nothing. Or else the song had been about rest, about a long day inked into night. She had tried to listen. She had tried. The song was still in the voices behind her, she thought, or perhaps the voices were in the river. She would listen, when she reached the bottom. She would listen, and this time, she would hear.